In the last year, I have really changed what I like to read. Up until this point I almost exclusively read fiction. I like murder mysteries (but only the corny ones) and romance novels (I stick to Christian versions). Recently, however, I have discovered the wealth of knowledge that is available through non-fiction books. I now almost exclusively read non-fiction. I love learning about different people's ideas and experiences. My favourite books help me move forward in my journey to minimalism. I like being challenged by this books and I appreciate the constant inspiration that they provide. Everyone does minimalism a little differently so it is beneficial to learn about several views. I then can use what works (or might work) for my family and let go of the rest. 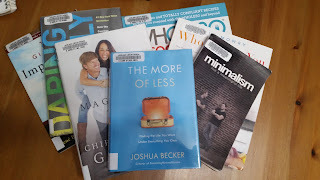 I am currently reading The More of Less by Joshua Becker. I appreciate his view of minimalism as he is a husband and father whose family dynamic looks similar to my own. I also have Minimalism: Live a Meaningful Life by Joshua Fields Millburn & Ryan Nicodemus on my shelf waiting to be read. "The Minimalists", as the authors refer to themselves, have a more extreme view of minimalism, but it is one that I enjoy learning about. This year I have also embarked on a journey to better self-care and food is a large part of that. I completed a Whole 30 in April and I have been interested in the power of food since that experience. I have The Whole30 Cookbook by Melissa Hartwig and Whole New You by Tia Mowry (who remembers Sister Sister?) on my bookshelf. I look forward to incorporating healthy and delicious meals into my life, thereby enhancing how I feel. My friend recommended the author Brene Brown to me so I added 2 of her books to my 'to-read' list: The Gifts of Imperfection and Daring Greatly. Brene Brown's work has heavily influenced my friend's parenting style and the way she approaches relationships in her life. I am eager to learn more when I read the books. I also have a fun (still non-fiction) book on my to-read list. I am looking forward to diving into The Magnolia Story by Chip and Joanna Gaines. I love watching this couple on T.V. . They always interact with love and respect and I admire their marriage. I am excited to learn more about them! All the links in this post will take you to Amazon. I am not being compensated in any way shape or form for these links. It is just the easiest way to give you the most information about the books. I have borrowed these books through my local library, as I am on my no-spend year. What are you reading this summer? Any book recommendations?